Last night, Grand Duke Jean, now a five-time Urgrousspapp, attended the Odyssee Projetsnuecht 2013 of the Lëtzebuerger Guiden a Scouten, the Grand Duchy's scout association. During the course of the evening five groups of rangers and rovers aged from 17 to 23 talked about their travels and experiences during the course of the year; Luxembourgish scouts participated in camps and projects in Brazil, India, Senegal, Bosnia and Herzegowina as well as Georgia. 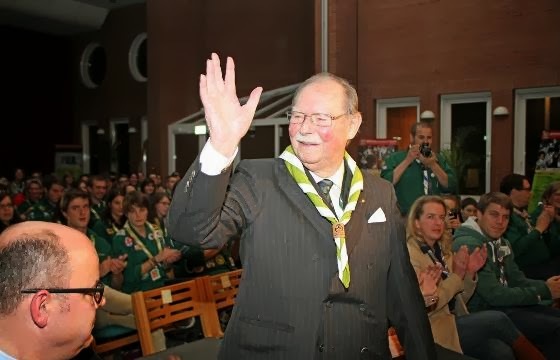 Grand Duke Jean has been the head of Luxembourg's scouts since October 28, 1945 and even at the age of 92 still makes it a priority to attend their events -- Kudos to you, Monseigneur. Wort has a gallery of visuals of the night.